Innovation in Mobile Hardware / Software is reaching its boiling point – From Rs 500 basic Mobile Phones to low cost 3G handsets to super charged Open source Mobile operating systems – The whole dynamics of mobile Industry is changing fast. Till now I had heard about regular single sim mobile phones and Dual Sim phones as well – But the latest launch from Dual Sim pioneers Intex have announced their latest launch that will accept 3 Sims at a time…WoW ! 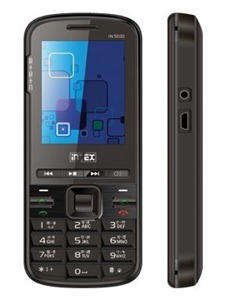 The Intex IN 5030 mobile handset is JAVA-enabled, measuring 111x48x14.8mm and has a 2 inch TFT screen with 65K colours. Coupled with the device comes two batteries; each battery delivers a talk time of up to four hours and stand-by time of up 120 hours. The handset also has Mobile Tracker and auto call record facilities. Other features incorporated in the IN 5030 are a 1.3 MP camera, Webcam, Bluetooth with A2DP, FM radio recording, audio player with equalizer, sound recorder, video player, video recorder and games. The phone has SMS capacity of 200 and a phone book capacity of 1000. The external memory can be expanded up to 4GB. The Intex IN 5030 has all these features at price of just Rs.4700.